I was hesitant about buying these but I am glad I did. They are so comfortable. They have a bit of a smell when you first open them, so let them air out for a day or two. 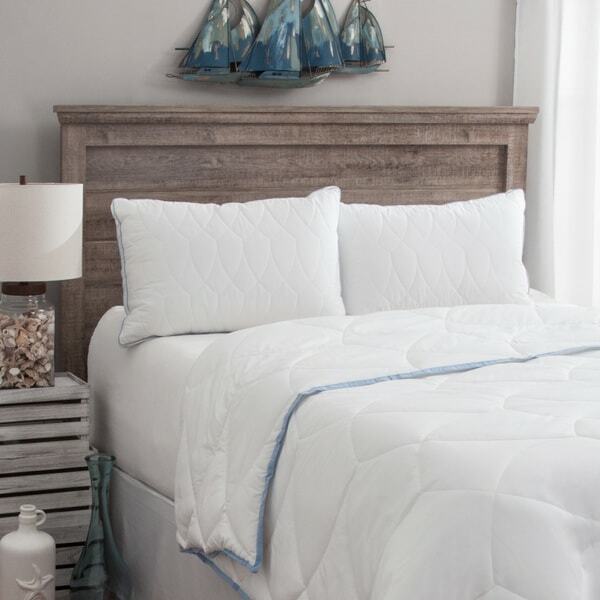 Get a taste of cool island breezes with this new collection of Tommy Bahama bedding. The fabric is crafted with a breakthrough combination of cotton and nylon, which offers a cool touch feeling and helps to wick moisture away. The outside features an Aegean wave design complimented with blue piping and a 2-inch gusset, complete with the famous marlin embroidery logo. Matches to Overstock item 23886829 to complete the look of your bed. Talk about plump, sink head into, supportive, soft and quilty -- this is definitely the pillow for you! For the last decade I have purchased only Tommy Bahama pillows, and this Cooling Nights version really doesn't overheat -- I don't know how they do it, but it stays cool and comfortable all night long! I'm a picky sleeper and living in FL means warm nights - this pillow delivered! I didn't expect it to be cool all night - so first 15 minutes felt great and I was sleeping! The pillow was too high for my husband causing a stiff neck in the morning. It was ok for me because it allowed for some molding into a comfortable shape (my favorite pillow was down but somebody was allergic to it). As for being a “cooling” pillow it is. As long as you turn it over. I didn’t think it was any different than other pillows I’ve had. Overall a nice pillow but undeserving of being labeled “cooling”. These pillows are exactly what I’ve been looking for! I wanted something similar to My Pillow without the high cost and I found it In these Tommy Bahama! I’ve tried so many different kinds with varying degrees of luck and I am thrilled with these. They wash up beautifully too! I purchased this pillow for my master bedroom and I love it. It does stay cool most of the night and fluffs up nicely. It’s not too firm just right. This pillow was so amazing, we bought two. It is very full so probably wouldnt work well for a stomach sleeper. We side sleep and they arr absolutely perfect. Great quality and they held up well in the washing machine and dryer. Very comfotable and not at all lumpy. This pillow does have good support! As far as the cool aspect of the pillow it is cooler than some of down alternative pillows but still holds a lot of heat. The good thing is if you flip it often while sleeping it stay fairly cool. These pillows are perfect! Just the right amount of support and are cool throughout the evening! Too soft, but good quality. Love them, am purchasing a couple more for the guest bedroom. I LOVE these pillows.. they don't really cool, but they are super comfy and love them. Great pillow! Bought for use in a vacation home & will definitely order again for use at home. They have good "loft" & are very comfortable (I am a side sleeper). Cool pillow. I live in hot south texas.